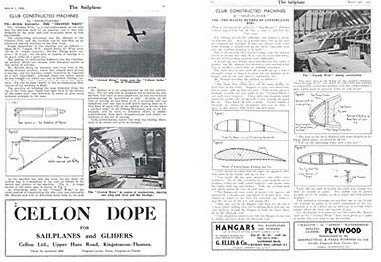 Reproduced from AUSTRALIAN GLIDING by kind permission of the Editor, Martin Simons. In the decade 1925-35 the technical leadership of German glider manufacturers was so great that very few original designs in other countries survived beyond the prototype stage. One of the exceptions was the English “Wren”. The first of the series, the Crested Wren, was flown by its designer-builder, Corporal W. L. Manuel in 1931. It was cheap and easy to build and quickly proved itself to be fully controllable and capable of soaring quite well. Its performance was probably comparable with that of the Grunau Baby 1, which appeared in the same year, but the Wren was smaller and easier to build. The wooden structure followed standard practice, but Manuel devised a simple mass-production method of producing wing ribs without the usual elaborate jigs. Plywood blanks were cut and shaped together in a block, like model aeroplane wing ribs, and then the ply webs were edged with thin spruce capping strips. The ailerons were extensively cross-braced to improve their stiffness, but they were not differentially geared and no wing washout was used. The fuselage had a tall pylon to carry the wing above the pilot’s head. The view upwards was very restricted, especially since the slight sweepback of the wing brought the leading edge at the root further forward than strictly necessary. The sweepback was hardly enough to improve longitudinal stability and the Wrens, with their all-moving tails, were very unstable and without any means of trimming. The control cables to the tail were external for much of their length, and a single bracing wire ran from the open bungee hook fitting on the rather pointed nose to the wing strut fitting on the wing. These wires were always slack in flight and were often removed altogether. 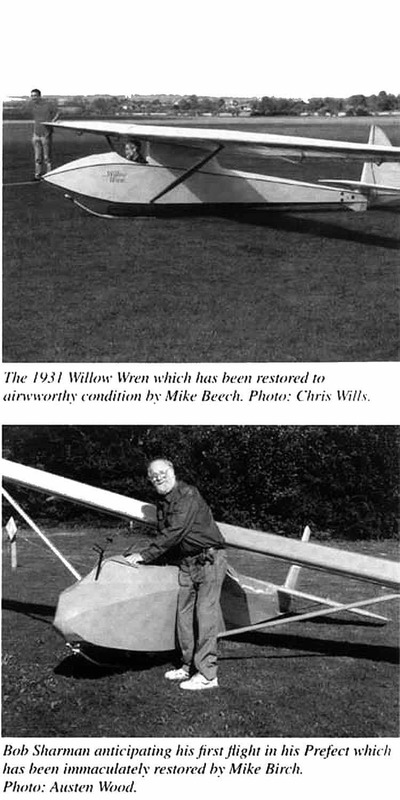 Manuel himself built two more Wrens, each incorporating minor improvements. The Willow Wren had a re-designed elevator and internal control cables, the Blue Wren of 1934 had washout to cure the spinning tendencies of the earlier models, and the ailerons were covered with oak veneer. Meanwhile amateur groups built their own versions from the Willow Wren plans: the Golden Wren, which had extra stiffening in the fuselage and extended ailerons, with an enclosed cockpit, and the White Wren, which had dihedral. Both these models had a wide leading edge transparency to give the pilot a view to the inside of turns. A Willow Wren was built in Australia by F. M. Hamilton, and flew regularly in the Sydney area from 1935 to 1937. The Blue Wren, after a couple of years in England, was exported to South Africa. In February of 1935 Manuel and his associates advertised that an improved Wren, called the ‘Dunstable Kestrel’ was available. The Kestrel was identical to the Blue Wren but was strengthened slightly and had some detailed improvements such as a deeper landing skid and differential ailerons. The new machine was offered complete at £130, with discount for bulk orders, but apparently only one factory model ever saw the light and it was sold to a purchaser who had not progressed beyond ‘hops’ in the primary glider. Its fate is unknown but may be imagined. However, Manuel sold sets of drawings at £6. 6s. a time, and four Kestrels were eventually built from these, one in England, by W. E. Godson. The other three were Australian. One was built by R. New in West Australia, one at Horsham by R. Balsillie, and another by Pery Pratt at Geelong. All three played their part in the development of gliding in Australia during the war years and after, and they are well remembered. The Balsillie machine was badly damaged, and was re-built by the Igguldens, its remains are now in South Australia. Ric. New’s Kestrel is still in existence at Cunderdin. In England only the Willow Wren, restored to museum condition by Manuel himself survives, The Golden Wren flew a good deal during the immediate post-war years but was eventually condemned because of glue deterioration. 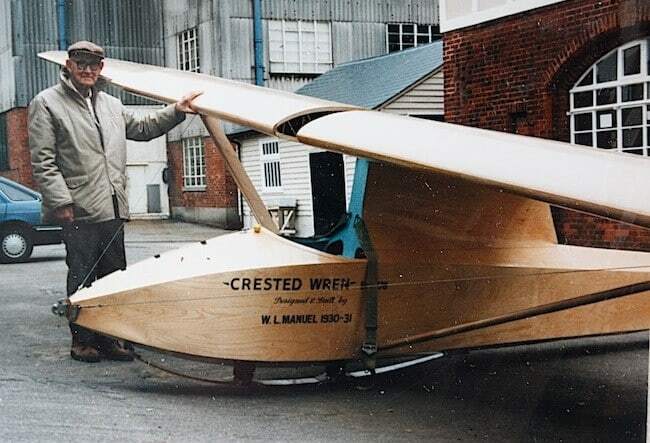 Godson killed himself in his Kestrel by spinning in at the British Nationals in 1939; Hamilton’s Willow Wren suffered a similar fate (not being flown by Hamilton) in 1937. The others vanished without trace. In 1964, Bill Manuel (above) restored his Crested Wren in his first floor flat. It had to “launched” out of the building from an upstairs balcony and taken to the Brooklands Museum where he worked. There it was finally covered and assemled.